We have decided to make a change to the Carnival Ecstasy itinerary for her sailing departing from PortMiami Friday, August 28. Given the projected path of the storm, on Saturday, the Carnival Ecstasy will now call to Nassau from 10:00 AM to 5:00 PM and have a day at sea on Sunday. 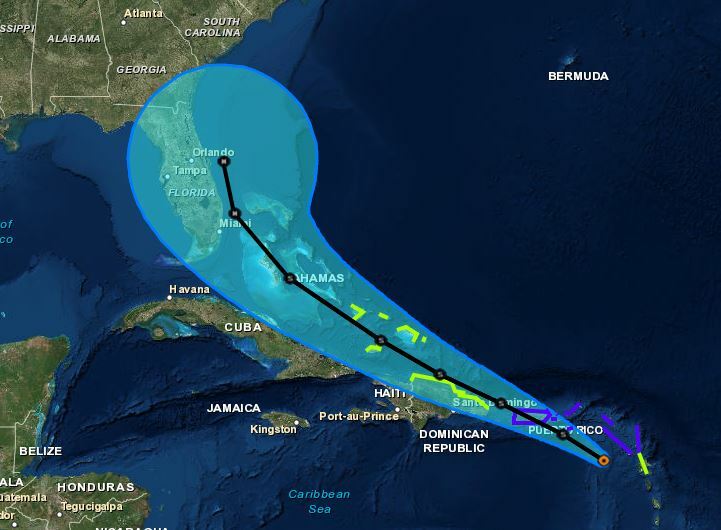 Carnival Cruise Line and all other cruise lines in the region are monitoring Tropical Storm Erika as the Storm track keeps changing. Erika currently has maximum sustained winds of 50 MPH and is moving towards Southern Florida at 18 MPH. Cruise Hive will be keeping cruisers updated. Due to the current path of the storm, Independence of the Seas will now depart Port Everglades at 3:00 p.m. Check in and boarding will take place between 11:00 a.m. and 2:00 p.m.
We encourage guests sailing on Adventures of the Seas, Enchantment of the Seas, Majesty of the Seas, Oasis of the Seas, and Freedom of the Seas monitor this website for any additional updates. Tropical Storm Erika is heading through eastern parts of the Caribbean and could also head towards the Bahamas. The storm is now also affecting cruise ships. Royal Caribbean Blog is also reporting that Adventure of the Seas which is operated by Royal Caribbean has also changed itinerary due to Erika. The ship was affected by last weeks Hurricane Danny and now Tropical Storm Erika is forcing the ship to change a sea day today with a call at Curacao and have a sea day on Friday. The cruise line is also monitoring itineraries for Oasis of the Seas, Freedom of the Seas and Independence of the Seas. Tropical Storm Erika has maximum sustained winds of 50 MPH and is moving west at around 16 MPH. the National Hurricane Center in Miami is reporting that a slight increase in strength is predicted over the next 48 hours. The storm is expected to become a category 1 Hurricane soon. Erika is 125 miles west of Guadeloupe. There are watches and warnings for most of the popular cruise ports in the region. Cruise Hive recommends you keep checking our Hurricane tracker for latest tracking updates and we’ll keep all readers updated on any new developments that impact cruising.